OptomaUSA’s new BE Sport3 Bluetooth In-ear Headphones are excellent for music listening during active sports, while reading the paper, and when doing the dishes. Choose a comfortable set of ear tips from the many sizes and materials included, then select a pair of wing stabilizers to keep the buds in place while on the go. Stow the headphones in the squishy neoprene case with an affixed carabiner clip. Charging via an included micro USB cable is straightforward. So is Bluetooth pairing with your iPhone, iPad, and iPod touch. Inline volume and play/pause buttons are usable once you are familiar with their locations. 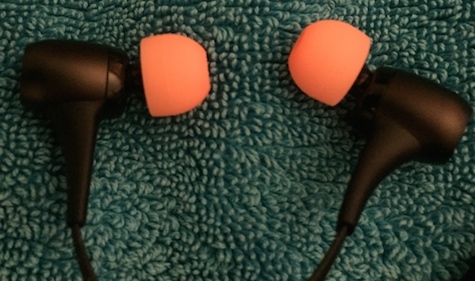 The physical product is extremely lightweight and convenient when the cable connecting the earbuds is draped behind your head. The speaker driver housings are magnetized and hold together to make a loop for tangle-free hanging on a hook. Sound is very good, especially in the midrange and treble areas, with crisp performance and splendid separation of instruments and vocals. Bass is punchy and does not overwhelm. Do your best to obtain a snug fit for optimum audio, but be careful when exercising where you won’t hear traffic or other possible dangers. BE Sport3 Bluetooth In-ear Headphones are water, sweat, and dust resistant, but you can’t go swimming in them. Playback battery life is up to ten hours, depending upon volume and control module activity. Aluminum and polycarbonate are the durable materials used. The colorful tips and wing inserts are stylish and attractive. Make the tiny cover to the micro USB charging port a bit larger or more rugged. It feels like it will snap off too easily. Raise the three finger-press controls for louder/softer/play-pause a bit higher on the control module, because these controls are almost imperceptible to the touch. Replace the black cable and control module with a much brighter color. It’s nearly impossible to see what’s what on the all black module. I have not seen the rose gold model. Enlarge the microscopic charging and status LED. Include another storage sack for all the extra ear tips and wing segments so they don’t get lost. 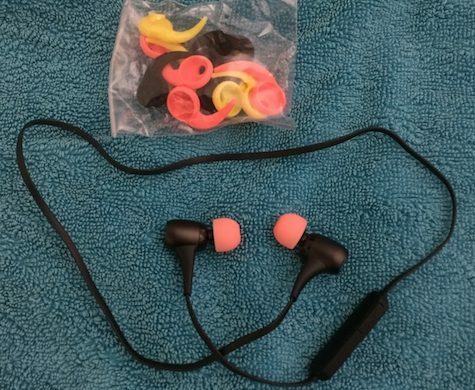 NuForce BE Sport3 Bluetooth In-ear Headphones receive my personal recommendation, aside from those minor gripes, because the fit, sound, and build quality are first rate. Our MyMac Review Rating is a strong 7 out of 10.